This is the beginning of a new school year and my 18th year as a teacher. Each year, I pack my room up at the end of the school year in June, then unpack it again in August. The upside to this is that I get to go through everything and make sure I really need those 15 rulers when I no longer teach math or science. Because my job is now primarily geared toward supporting classroom teachers, I made the difficult choice to give away some of my many, many children's books. I didn't really need a classroom set of Horrible Harry. So I have begun to cull through my many books and box up the ones I can bear to part with. Each year, I come across the one book I have kept for 47 years. The paperback cover is bent and torn in one corner. The pages have the delicacy and that browning around the edges that only comes from age and repeated readings. Inside the cover is my fifth grade signature along with my address. Even then, I feared someone would make off with my book and would need to know how to get it back to me. The book is Helen Keller's Teacher, an autobiography of Annie Sullivan written by Margaret Davidson. I bought that book for 50 cents back when Scholastic books were at most a dollar. I read that book, and it changed my life. I remember looking at myself in the mirror after I had finished the last word and saying to myself I am going to be a teacher. So profound was that moment that I have never forgotten it. I remember I was wearing a blue flowered jumper my mother had made for me, and I remember realizing I had found my calling. Annie Sullivan had been hired by the Keller family to "tame" their wild daughter. Helen Keller had been blind, deaf, and mute since her 2nd birthday. She had become like a wild animal, and refused to be touched or taught anything. Helen was sometimes dangerous, and always angry. Annie Sullivan, a young woman of only twenty-one, had the equivalent of a high school education. She was half-blind herself, and had graduated from Boston's Perkins School for the Blind. Annie had struggled for weeks to gain Helen's trust, and had succeeded. Helen's behavior was under control. 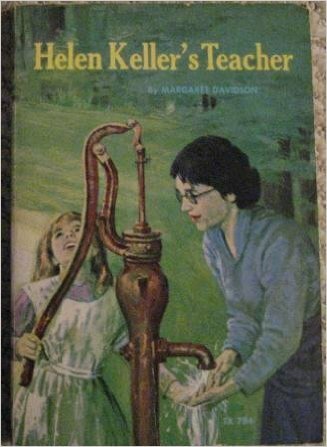 The Keller family was satisfied with what Helen had learned, but Annie was not. Yes, Helen could follow commands, but Annie believed that Helen was capable of so much more. As I do each year, I turned in the book to my favorite section. Annie and Helen had spent the morning working on learning sign language letters, and Helen was getting restless. Ever resourceful, Annie took Helen outside and into the pump house just beyond the Keller home. Annie pumped water up from the well, put Helen's hand under the water, and spelled W-A-T-E-R over and over into Helen's hand. In an instant there was a noticeable change in Helen. She stood stock still. Annie said later that it was as though a light passed over her face. Helen understood that those letters spelled the cool liquid in her hand. It had a name. Over the course of a few minutes Helen learned 30 words, one of which was her own name. I did not know then that this vision of education I adopted would shape my entire life. I understood then, as I know from experience now, that learning is only accomplished through perseverance and determination and the will to pick up and keep going even after failing. The good things in life are only accomplished through the will to keep going, to overcome our limits and to demand the best of ourselves. So many times as a teacher, I have seen that light pass over the face of one of my students. As a mother, I've seen first hand the power of sheer determination. I never settled for "good behavior" from my child. I wanted everything for him. I wanted him to read, write, talk, and be a part of the world. I wanted him to love Jesus and live by faith. I wanted him to be the best he could be, and I wouldn't let him settle for anything less. Annie once said, "People seldom see the halting and painful steps by which the most insignificant success is achieved." Every victory is hard won, with losses and wounds. Our lives are a series of battles won and successes achieved, but each one of those successes comes at a cost. I still thank Annie Sullivan for her example, and her influence on my life. I am thankful for that 50 cent book that was the catalyst for my choice of career, and the inspiration for my life as a mother.